Chef Spencer found his perfect pairing in Miss Alexandra. 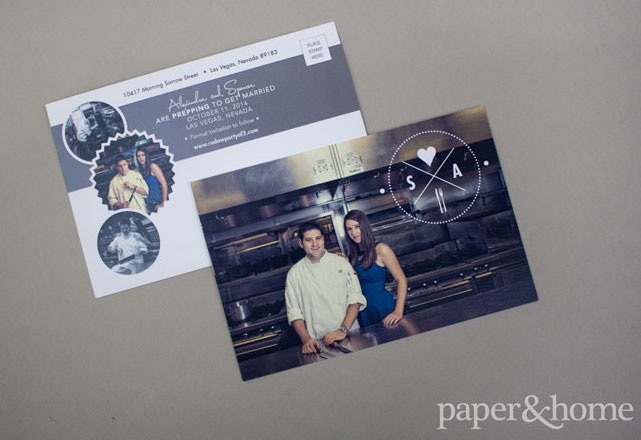 We made them the perfect chef save the dates for their wedding at Four Seasons Hotel Las Vegas. The awesome engagement photos for the save the date cards were provided by Ron Dillon Photography and we just ran with them. A custom monogram was designed with a knife and fork element, of course. We laid the monogram over a strong photo of the couple posing in a commercial kitchen. The backside of the save the date postcard features additional adorable shots of these two in the kitchen. We had some fun with the wording too: “Alexandra and Spencer are prepping to get married.” Get it? These chef save the dates were tons of fun. 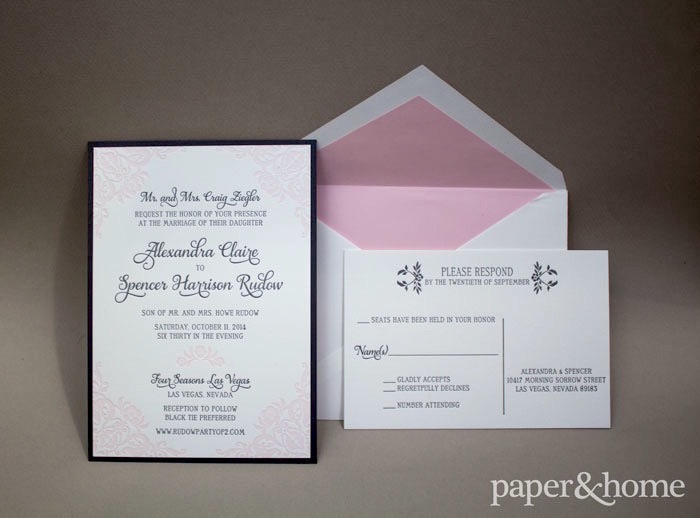 Moving on to the invitation, the couple switched it up and went with a more classic style. 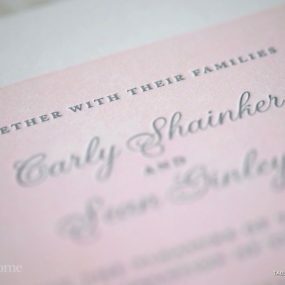 They fell in love with this pink letterpress wedding invitation design from our partners at Designers Fine Press, complete with a pink envelope liner. So cute. 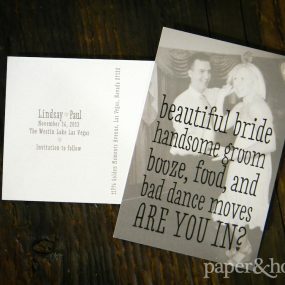 The invitation card was letterpress printed on a nice bright white stock. 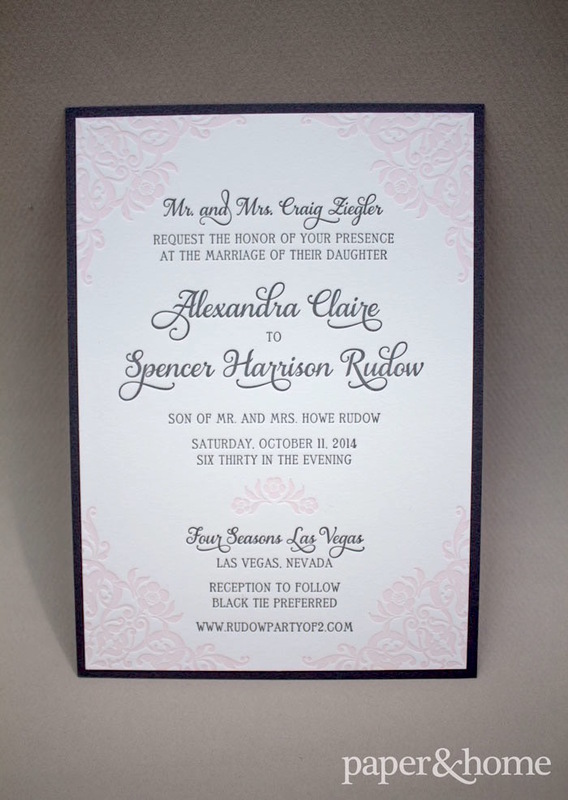 They chose two colors for their printing, dark gray and a soft pink. The contrast is gorgeous, the perfect blend of soft and strong. Adding to the strong side of the invitation, we mounted the card on a dark gray stock for added depth and thickness. This is truly a luxe wedding invitation. 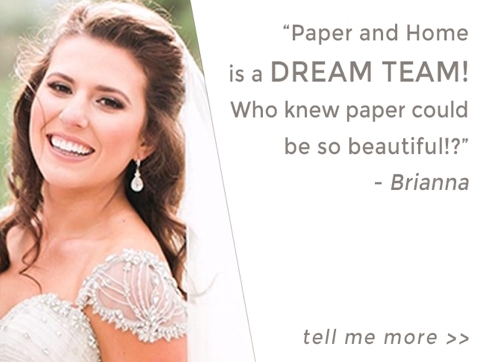 Before we move on to the reply card, how cute is their wedding website? Go ahead, look up, I’ll wait… Rudow, Party of 2? Love it! Ok, so the reply card was done in a postcard style—no return envelope needed! The strong gray ink made its appearance again. The soft flowers and leaves round it all out. 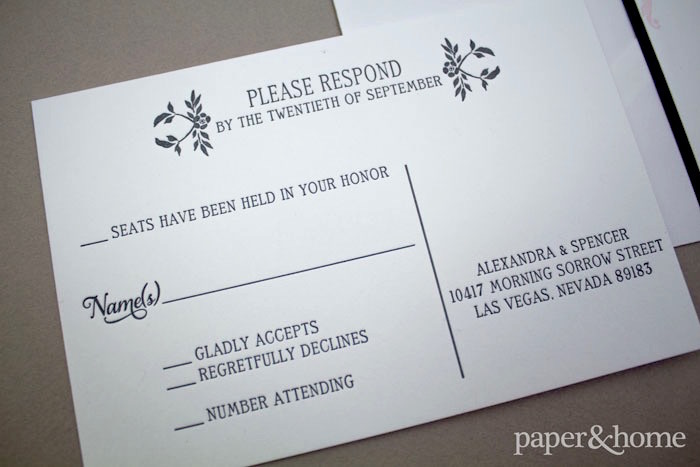 Our digital envelope addressing is so necessary. 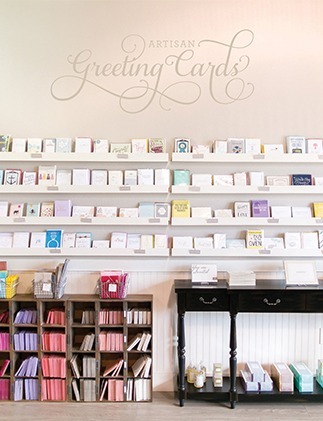 We take each and every one of your guest’s addresses and make them as pretty as the invitation inside. We can match fonts, colors, and design elements. Your friends and family will be so impressed before they even open the envelope! Not to mention the time you’ll save. Plus, no feeling bad about how your handwriting hasn’t changed much since second grade (we understand). 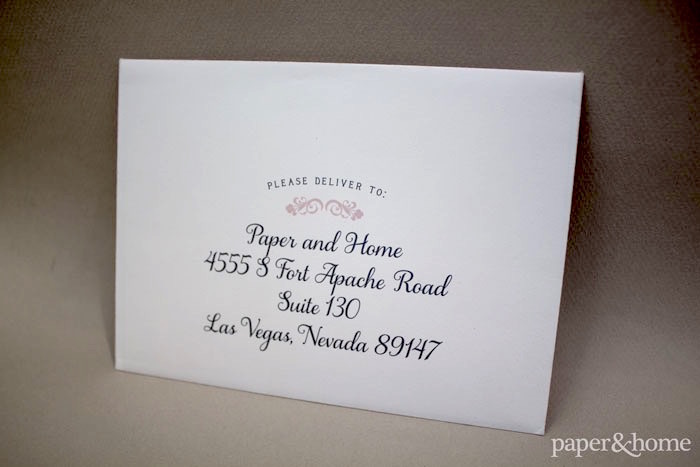 The addition of digital envelope addressing is worth the expense and it’s only a fraction of the cost of hand calligraphy. Alexandra and Spencer did what we often recommend our clients do; have fun with the save the dates and go timeless with the invitation. 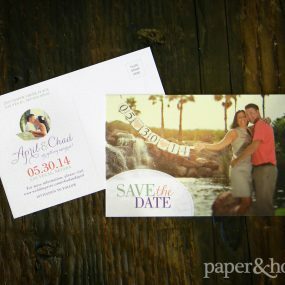 You get to show off your personalities on the save the dates and then create an elegant invitation that you’ll love until death do you part. Win win.